Manny Pacquiao is guaranteed $20 million from Bradley second rematch on 9th April 2016. 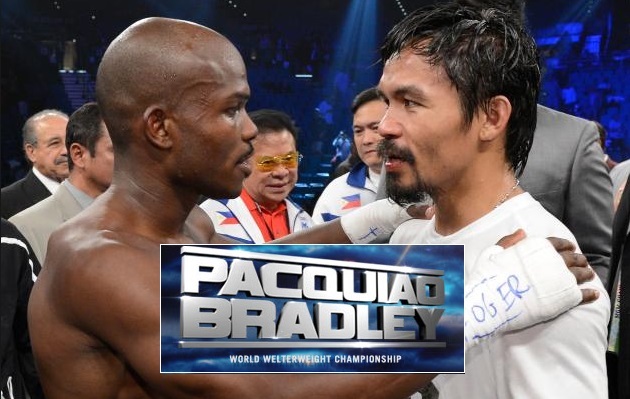 While Timothy Bradley will be taking home $6 million from his third showdown with Pacquiao. You can find Both fighters official fight purse details below. Official Purse Revealed: It is expected Manny Pacquiao is expected to earn around 20$ guaranteed for this fight. Top rank has disclosed both fighters purse in front of Nevada commission where Pacquiao’s fight purse is revealed as $7 million while Bradley’s official fight purse is $4 million. Both fighters however will get share of PPV revenue with Pacquiao set to earn guaranteed $20 million in total regardless of PPV sales. While Bradley can also make another $2 million from PPV share on top of his $4 million fight purse. Manny Pacquiao is set to take on Timothy Bradley for the third time and the fight will take place on 09 April 2016 at MGM Grand, Las Vegas. Not many people expected this fight as Manny Pacquiao clearly outboxed Bradley in the first two meetings although first one was controversially awarded to Bradley. So its all set for 9th April 2016 showdown again but there will be a few things which won’t match the first two fights one of them is a purse for both fighters. Pacquiao-Bradley I Purse (2012): In the first fight between the two fighters Manny Pacquiao was guaranteed $26 million while his total earnings from the nights work were around $36 million if we also count his PPV upside. While Timothy Bradley was guaranteed career high $5 million in 2012. 890,000 ppv buys were reported which were pretty good considering Timothy Bradley was sort of new to PPV scene. Pacquiao-Bradley II Purse (2014): The second fight was expected to do better than the first one after Bradley was given a controvertial decision but it did not pan that way. Pacquiao however went home with another guaranteed $20 million plus ppv share making his total earnings from second fight over $30 million. While Bradley made $6 million guarateed in the 2014 rematch. Manny needed a $2 mil advance? ?